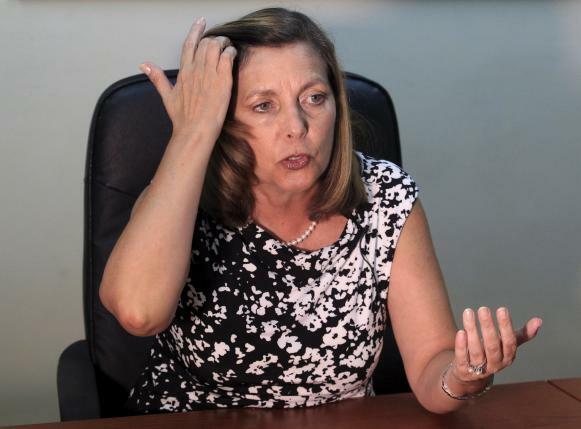 Josefina Vidal receives a check from the United States for $4,085 once a year, rent money for the U.S. naval base at Cuba's Guantanamo Bay. But Cuba's government refuses to cash the checks, made out to a non-existent Treasurer, because it sees the U.S. occupation of Guantanamo as illegal. Former leader Fidel Castro used to stuff them into a drawer and Vidal says they are now stored in archives "like a historical document," a symbol of the bitterness between the two countries for over half a century. "I receive them personally, year after year," Vidal, the director of U.S. affairs for Cuba's foreign ministry and its lead negotiator in bilateral talks with Washington, told Reuters in an exclusive interview. "We have a collection." With the two countries now putting aside their Cold War-era rivalry and restoring diplomatic relations, many old bilateral conflicts are now being pulled out of storage for negotiation. Both sides see a chance for quick progress on some relatively simple issues, possibly including a civil aviation deal, but others will take years and they may never reach an agreement. On one side, Cuba wants back the 45 square miles (116 square km) of land at Guantanamo Bay in eastern Cuba. It also wants an end to the U.S. economic embargo, no more radio and television signals with anti-communist programming beamed into Cuba, and a halt to U.S.-financed "democracy programs" that Cuba says are aimed at toppling the government. U.S. President Barack Obama's administration says Guantanamo is not up for discussion, and its goal of lifting the embargo faces strong opposition inside a Republican-controlled Congress. Washington will also press Cuba on issues of human rights, democracy and other personal freedoms. Secretary of State John Kerry called on Friday for "genuine democracy" in Cuba and the United States wants the extradition of some U.S. fugitives living on the island. What the United States frames as human rights, Cuba sees as internal security, and it insists it will only make political changes according to its own needs. It also says it cannot hand over fugitives who have been granted asylum. Vidal recognizes the difficulties ahead but says Cuba is willing to tackle all the issues, no matter how hard. "I prefer not to be pessimistic," she said in an hour-long interview on Friday, when Kerry was in Havana to raise the U.S. flag at the recently reopened American embassy for the first time since 1961. Kerry also said the path toward normalization will be arduous but that reopening embassies was an important step. "There will continue to be issues on which we disagree or where they may not yet be ripe for transition or discussion or transformation," Kerry told a news conference. "We’re biting off a lot right now. This is a big agenda." The two sides will set priorities and timetables on an array of issues with a bilateral commission that will meet for the first time in September. Vidal said a civil aviation agreement, under which U.S. and Cuban airlines could win landing rights in each other's countries, is one area where a deal could be reached soon. She also said Cuba is willing to discuss areas of conflict, such as the 5,913 claims from Americans whose properties were nationalized after the 1959 revolution that brought Fidel Castro to power. The two sides would begin talks with a huge gulf between them. A Cuban law links negotiations on property claims to Cuba's own claims for damages caused by the embargo and other U.S. aggressions. Vidal said damages amount to more than $300 billion as of the year 2000, an amount far beyond the value of the U.S. property claims or what Washington would ever consider paying. Talks on direct mail, environmental protection and battling drug trafficking will resume, Vidal said, building on deals already reached in oil spill mitigation and sea search-and-rescue cooperation. On the most sensitive issue of political reforms, Vidal said Cuba will not give up anything to placate hardline opponents of Obama in the U.S. Congress or anti-Castro exiles in Miami. "No matter what we do or stop doing, these people ... are just going to ask for more and more and more," she said. "They don't what what's good for the Cuban people. They want revenge."